I must tell you about something that happened last night. 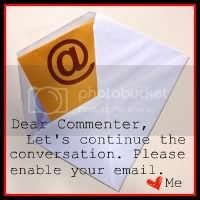 There are probably far better or more important things to write about, but this topic won for now. I have had some sore muscles in my neck and back lately, so my dear, sweet hubby insisted that I take a muscle relaxer and draw a bath to soak in for a while. This would be followed by a massage from him. Awesome. I love that man. After we put Gabe to bed, my husband returned to me with pills in hand and ordered me away from my cleaning to take a soak. "Nope. You need to go take a nice, long, hot bath. Take these. (muscle relaxers) Go." 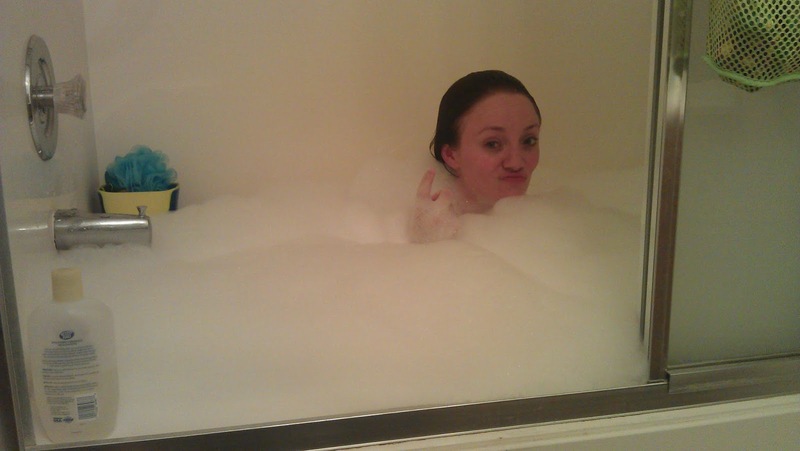 So I trudged up the stairs and started drawing a bath. 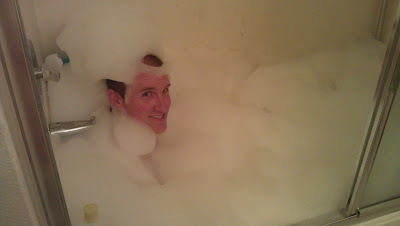 It was then that I decided that it needed to be a bubble bath. Had to be. But I didn't want to waste my body wash (I get the GOOD stuff, y'all!) so I went in search of that collection of small bottles of whatever-scented body wash that people buy you when they don't know what to get you. You know what I'm talking about and you have some too, don't you? 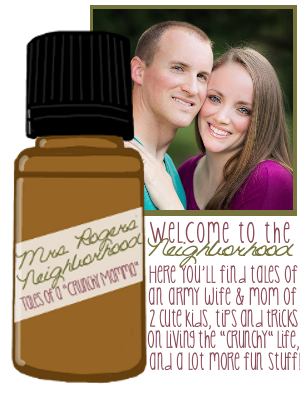 I found a pleasing scent and proceeded to squirt the entire bottle into the tub under the faucet. This was going to be glorious. 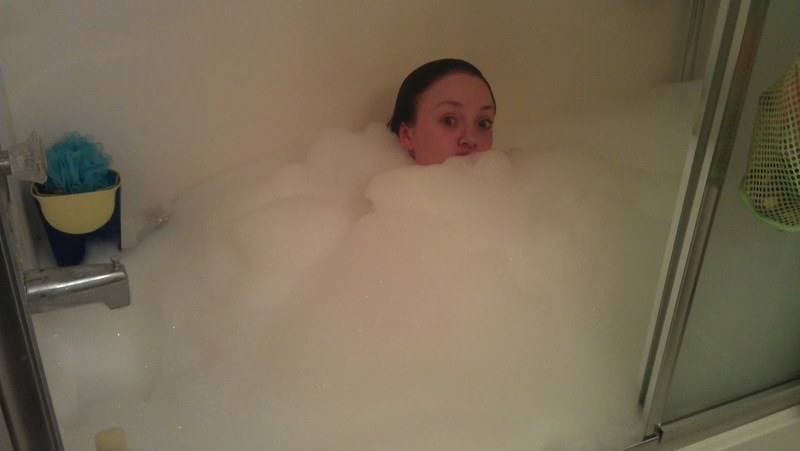 Once the bathtub was full, I had a pretty impressive amount of bubbles. I was excited. I felt like Julia Roberts in Pretty Woman (the BUBBLE BATH, people! Come on...give me some credit). I remembered that we have a jetted tub (we are shower people, so the jets are very neglected) - sweet! I thought the jets would probably feel great on my neck and back, so I fired 'em up! 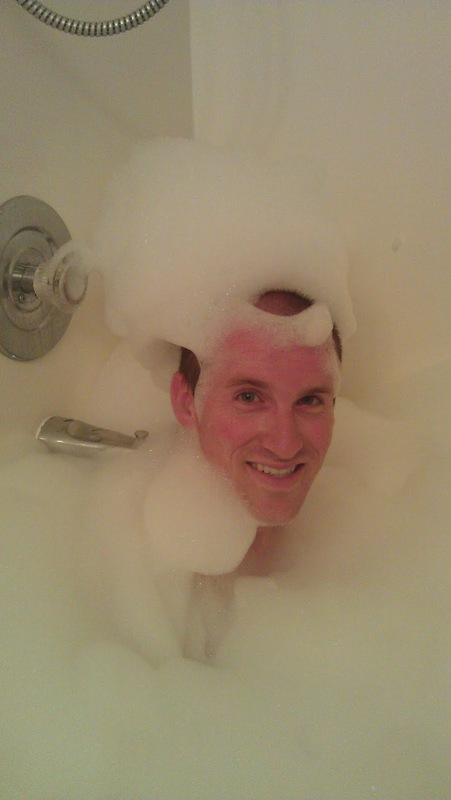 I didn't think about what the jets would do to my bubble bath. I closed my eyes and began my soak. Awesome....the smell of the strawberry body wash that I used was FANTASTIC! Then it started getting harder to breathe....what the...? I opened my eyes. Oh. My. Word. The bubbles had grown and multiplied! Gah!! McKay came running into the bath room, slid open the tub door (our tub has those annoying glass slider doors on it...) and began laughing. "Looks like you got one. 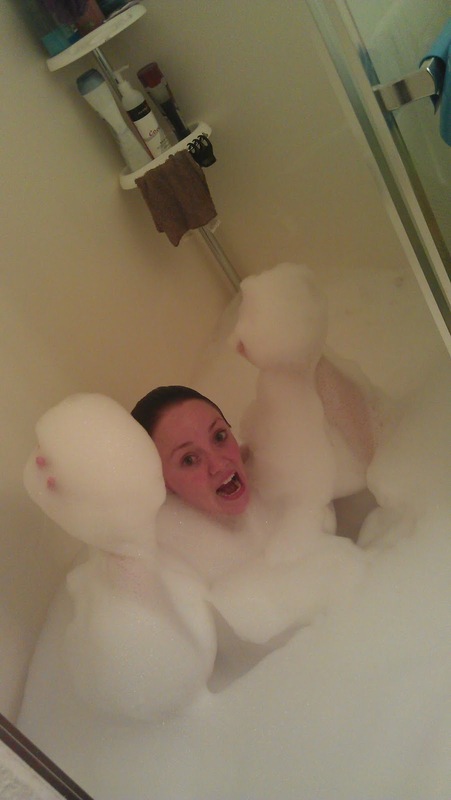 How much soap did you use?? How did you do this?!" "I used one of those bottles of useless body wash that ******** got me....and turned on the jets..."
"You used the whole bottle?!? [laughing pretty hard now] What did you think would happen when you turned on the jets?" "I don't know! I didn't think about it!" As you can see, it was pretty awesome. McKay decided (after getting my permission to interrupt my "pampering time") to join me. We acted like children. He had a bubble beard that looked like a mix between Abe Lincoln's and Santa Clause's. 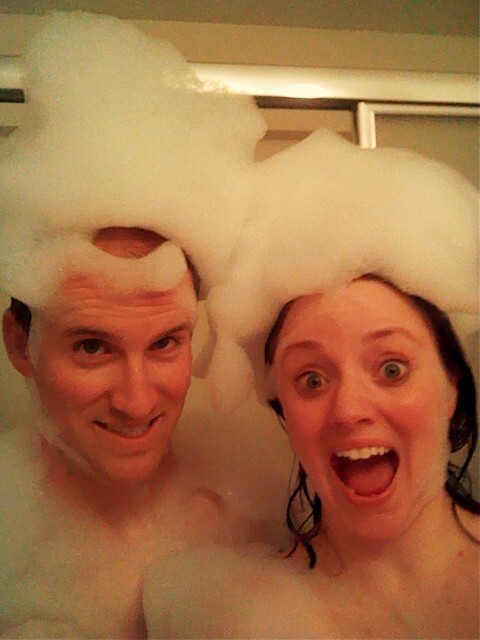 We both created Bubble outfits and gave each other bubble hats. I think we look awesome. Those hats could have made an appearance at the royal wedding. So you can see now that it was a pretty epic bubble bath. 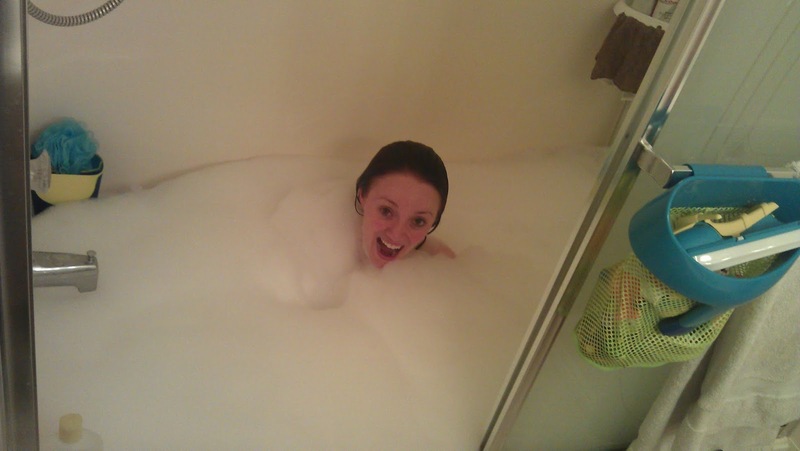 We shut the tub door and turned the jets on again to see just how much we could get those bubbles to grow. 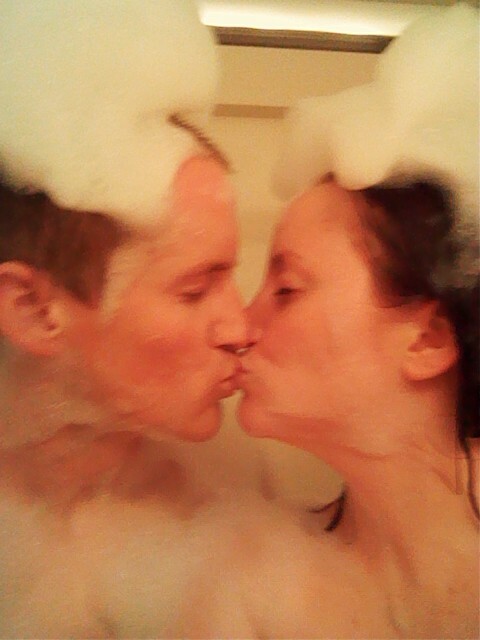 Let's just say it's a good thing we have doors on our tub, or there would have been bubbles everywhere! It got to a point where we could no longer sit and be safe. We got on our knees and eventually even that became precarious. We turned off the jets and stood up to examine our creation. 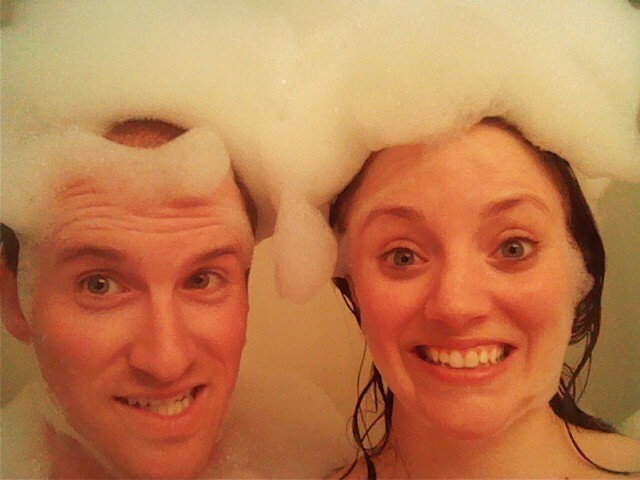 Bubbles to our waists. Wow. It was ridiculous. Best stay-at-home date night ever. That is too funny and cute! I guess the muscle relaxers kicked in later? hope your neck is better as I am sure you smell better.. hah! That's great!! hah!